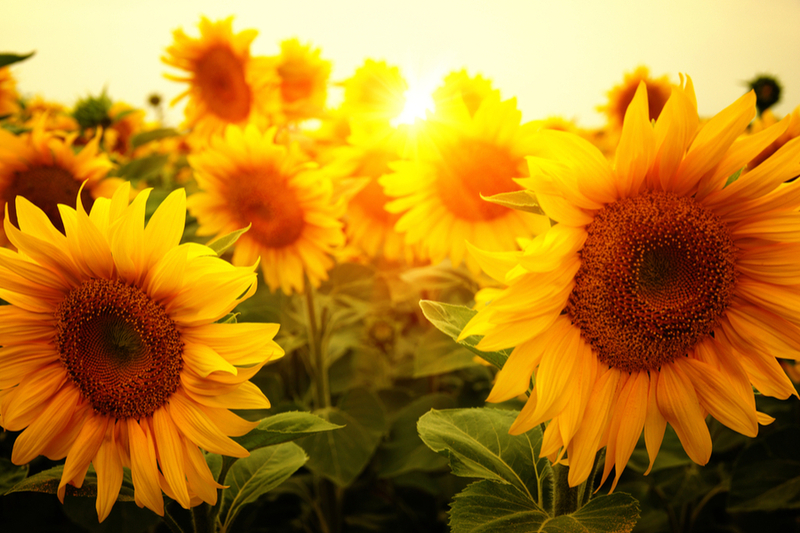 Growing Sunflowers - 5 Great Varieties To Plant This Year! When it comes to growing sunflowers, you might be surprised at how many stunning varieties are available. From tall to small, big to large, and everything in between, the noble sunflower plant comes in a multitude of sizes, shapes and colors. Whether you want to make a statement with massive sunflowers along a fence row, or dot your landscape with tiny bits of color here and there, there is a sunflower for you. And beyond their stunning beauty, growing sunflowers in your backyard can have some added benefits. Sunflower’s gorgeous big blooms and bountiful seed crop are a big attraction for honey bees and bumble bees. Attracting these pollinating wizards can be a great help in creating blooms and fruit all over your landscape. In addition, growing sunflowers attracts a whole slew of beneficial birds as well. If that wasn’t enough, there is of course, the healthy and bountiful seed crop growing sunflowers provides to you and the surrounding wildlife. The best part of all, growing sunflowers is easy! This simple to plant seed crop requires little maintenance, and can grow in almost any soil condition. Here is a look at few great varieties, both big and small, to plant in your landscape this year. Want to grow big? Here are two great varieties that can make a big statement in your landscape. Mammoth Grey Stripe Sunflower – The Mammoth Grey Stripe as its name implies, is a massive sunflower. In fact, it is known as the giant of all sunflowers. Stalks of the Mammoth Grey can reach up to 12′ high, and the flower heads are huge! If you are looking for a sunflower variety to harvest large amounts of seed – this is the plant. Not all sunflowers have to be huge, there are also some great mid to small-sized varieties that are excellent choices for potted plants or smaller flowerbeds. Firecracker Sunflower – The Firecracker is a great selection for small spaces, including pots and planters. Blooms are a fiery mix of an inner red circle with a burst of yellow on the outer petals. The flowering heads truly do look like a firecracker at the peak of explosion. Want to showcase your backyard garden on This Is My Garden? Perhaps you have a few tips on vegetable or flower gardening. How about becoming a contributing editor to This Is My Garden and share your story. Simply email us at info@thisismygarden.com, and your garden or garden tip might be our next feature!